Our recent update includes a new tool in the client profile that solves the training paperwork dilemma by creating a paperless training guide that uses electronic signatures and automatic data entry to ensure a quick and complete training guide process that saves you time and effort, and leaves you feeling confident and safe that your employee’s client-specific training documentation is accurate and up to date. Here are the step by step details of how to setup and use a client training guide in QSP and QSMobile. Under the Service Planning tab in a client’s profile is where you’ll find the “Training Guide” sub tab. The process begins by creating a master training guide. Trained employees will then sign their own employee-specific version of the training guide, which will include the signature of the trainee and the client. Once saved, this automatically creates a client-specific training record on the trainee’s employee profile. At the very bottom of this tutorial are an explanation of the security permissions that need to be enabled to fully utilize this feature. Then select the Training Type from the drop down menu. These are the same training types that are used in the Employee profile -> Client Specific Training (highlighted in red in picture 4a). Select “Include Medication Training Checklist” to have a default, standalone document be automatically created upon saving the Master Training Template ((highlighted in blue in picture 4a). 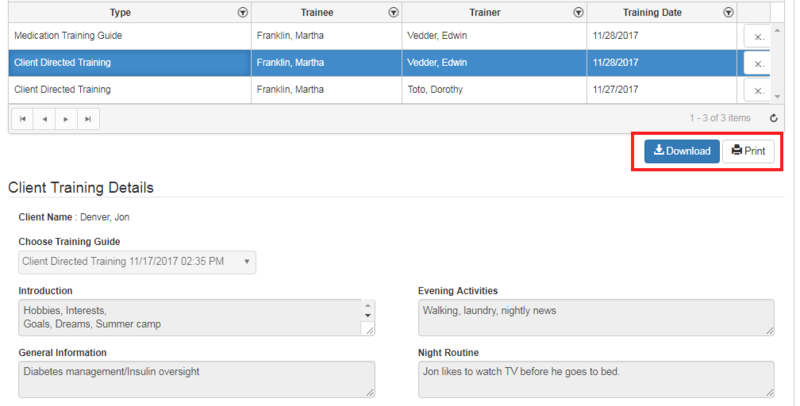 Next, add the client’s training details in the 16 available text areas, highlighted in purple in picture below. Once the master training guide(s) has been created, an employee-specific copy can now be added. This can be done from QSP or QSMobile. From QSP, select “Add Training List” and then from the Training Guide drop down select the appropriate the master training guide. 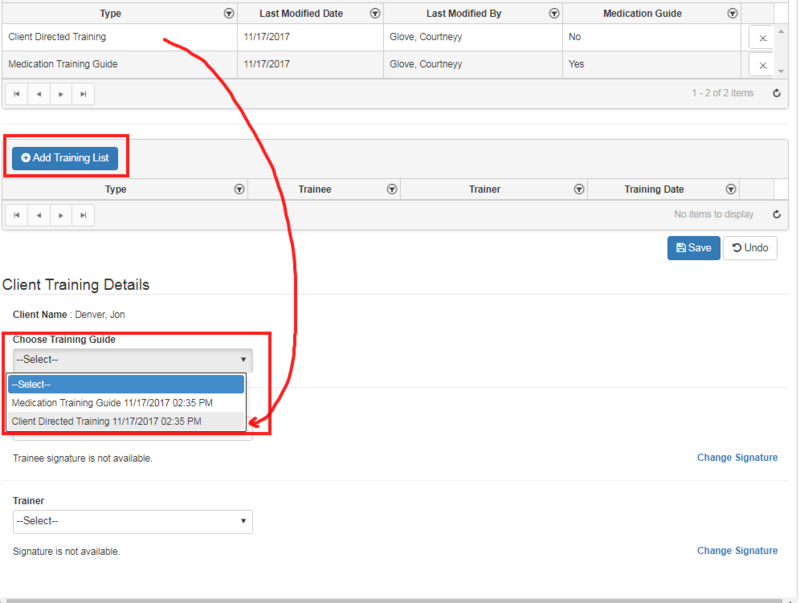 Once selected, all of its details will be auto-filled leaving 3 required signature fields at the bottom which will be filled out by the trainer, the trainee, and the client. Selecting the Trainee and Trainer’s name from the drop down menu will display their store signature. 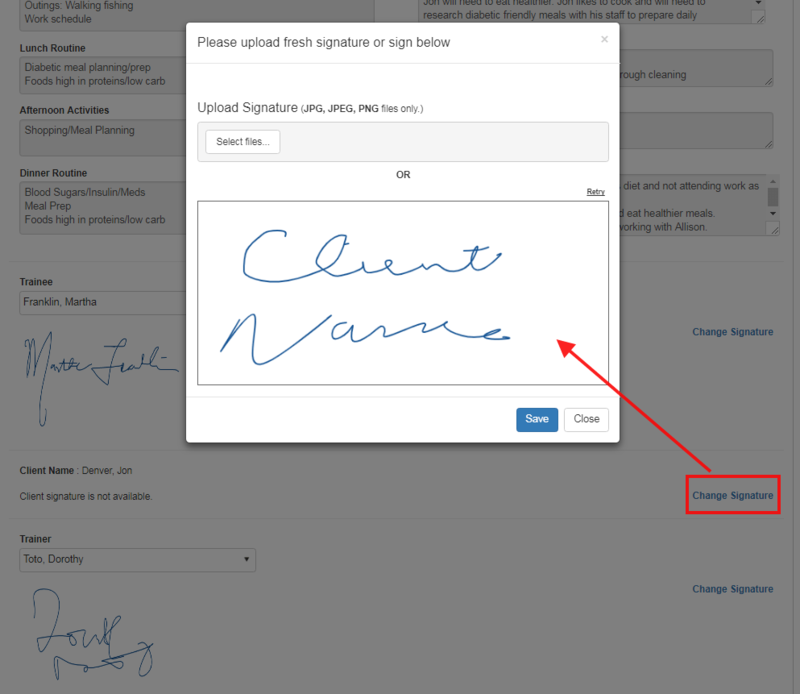 If no signature has been previously stored in their individual employee profiles, they can be manually added at the time of signing the training guide by selecting “Change Signature”. The client signature will be automatically stored once it is entered for the first time after updating it via the “Change Signature” option. 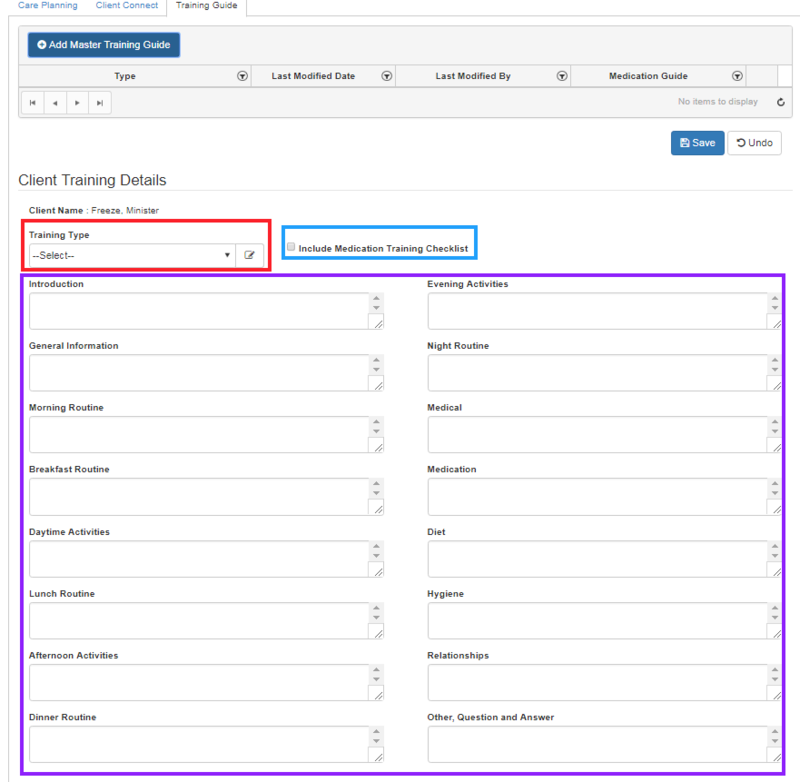 Once saved, this automatically creates a client-specific training record on the trainee’s employee profile that captures the name of the training type, the client name, the trainer and the training date. You can also print a paper copy for your records! Watch this 4 minute video to see how to complete a employee-specific client training guide through QSMobile. Ensure each security role has the new client training guide permissions properly set. Here’s a look at that setup which can be found in QSP under Utilities -> Security Maintenance. The permission “Client Training Guide Maintenance” needs to be configured with the appropriate attributes to control setup and use of Master Client Training Guide. It’s recommended that case manager-type roles have full permissions here. The permission “Client Training Guide Employee Specific” needs to be configured with the appropriate attributes, and is dependent on “Client Training Guide Maintenance” having “Access” enabled. It’s recommended that field staff/leader-type roles have some access here.